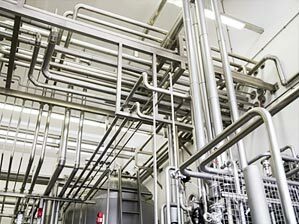 Atlantic Constructors can handle any piping challenge from industrial process to high purity piping systems. 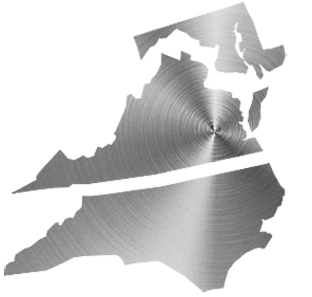 Our ASME “PP”, NBIC “R”, and “U” code certified fabrication shop works with all alloys, and pipe sizes from ½” through 60.” Whether it is orbital welding, TIG, MIG, SMAW, or soldering, we can do it. All of ACI’s welders are ASME certified. Atlantic Constructors performed the process piping, utility piping, steel erection, miscellaneous metals, rigging/equipment setting, and HVAC on this new 55,000 sq. ft. multi-story, pharmaceutical production facility. BI Chemicals produces Active Pharmaceutical Ingredients (APIs) and Intermediates for the pharmaceutical industry. 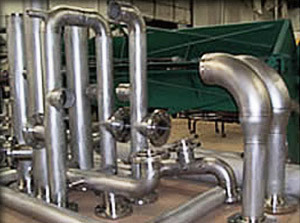 HONEYWELL, JACKETED POLYMER PIPING - CHESTER, VA.
Atlantic Constructors fabricated and installed 500+ feet of stainless steel jacketed pipe as part of Honeywell’s polymer piping system. 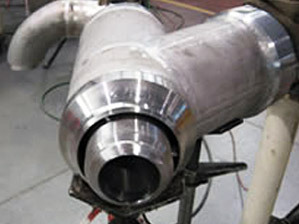 The schedule 160 stainless steel inner, carrier pipe was jacketed by schedule 10 stainless steel outer pipe. All welded by our ASME certified welders. DSM manufactures high performance fibers used in numerous applications from bullet-proof vests to fishing lines. Atlantic Constructors has installed over 18 miles of process piping over the course of five construction phases, at their Greenville plant. Pipe spools where fabricated and painted in our fabrication facility. The last phase was completed in 2007.